Whakatane wedding photographer and video Nuance Photography has the privilege of presenting the recent photo shoot for the lovely Roz and Frazer who finally married at Surf and Sand at Ohope Beach in the Bay of Plenty, New Zealand. Rain threatened the whole day but thankfully nothing eventuated and the wedding day was a flying success. It’s alway risky to marry in spring in New Zealand as the weather is very changeable but it didn’t end up raining until later that evening. An outside ceremony was held on the park at Surf and Sand directly on the main Ohope Beach behind the sand dunes. Afterwards, drinks were enjoyed while we captured some family photos and a group shot. We headed to the jetty at Port Ohope for some creative wedding photos and then back to reception for further celebrations. Wedding venues in Ohope are few and far between. The two that we photograph at mainly are Surf and Sand and the Ohope Golf Club. The latter can dress up nicely for weddings and Surf and Sand is a designated wedding venue and conference centre. 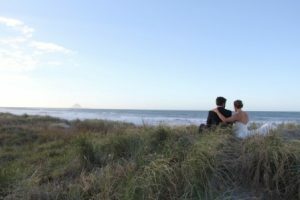 We know the top photo locations in Whakatane and Ohope and can offer you great advice if you are thinking of getting married in this lovely seaside village. For any brides considering eloping in Ohope or the surrounding area we have excellent and affordable wedding packages including a NZ registered celebrant, photography, flowers, accommodation, transport, fine dining for two, hair and make up all for only $2990 NZD. We have sourced the best wedding vendors and suppliers. We have also pre-negotiated the best price to pass on to you so you can enjoy a relaxed and fantastic day at Ohope beach for your wedding. Learn more. Enjoy our wedding highlights teaser of Roz and Frazers Ohope beach wedding.